At The Architect’s Newspaper, we’re plain addicted to Instagram. Sure, we love seeing Brutalist concrete through “Inkwell” or “Ludwig” filters, but there’s also no better place to see where architects are getting their inspiration, how they’re documenting the built environment, and where they’ve traveled of late. A new exhibit on the historical iterations and potential of scaffolding went up at the Center for Architecture, and Shohei Shigematsu of OMA was the exhibition’s lead designer. A short hop across the East River, the Noguchi Museum is gearing up for the October 25 opening of Gonzalo Fonseca’s architectural sculptures, many carved from stone. OPENING SOON: ’The Sculpture of Gonzalo Fonseca’ is a retrospective of enigmatic works in stone, drawings and sketchbooks by the Uruguayan-born modernist Gonzalo Fonseca (1922–97), a contemporary of Isamu Noguchi in New York City and the stone-working communities around Monte Altissimo in Italy. Organized in collaboration with the Estate of Gonzalo Fonseca and curated by Senior Curator Dakin Hart, it is the first museum exhibition of the artist in New York since 1971. On view Oct 25 through Mar 11, 2018. Read more at noguchi.org. #GonzaloFonseca … Gonzalo Fonseca, ‘Piazza,’ 1985. Persian travertine. Collection of the Estate of Gonzalo Fonseca. Photo by EPW Studio/Maris Hutchinson. SO-IL‘s Florian Idenburg paid a visit to a panopticon prison in Haarlem, Netherlands called Kijk in de Koepel. His visit was timed perfectly with two news bits that had us chuckling this week: One upsettingly real (Jeremy Bentham’s literal severed head displayed in an upcoming exhibit), and the other pure satire (meet Synergon). Andrés Jaque, founder of Office for Political Innovation, posted the opening of his new exhibit titled Transmaterial Politics, which opened at Tabacalera Madrid on September 28. Poppy and probing as always. MAD Architects threw us back to their Ordos Museum in inner Mongolia, a mass of organic and rigid forms cloaked under an undulating shell of metal tiles. Without wanting to, we will imagine it springing to life at night and prowling the Gobi Desert under a shrouded moon, much like Gehry museums (wherever they live). 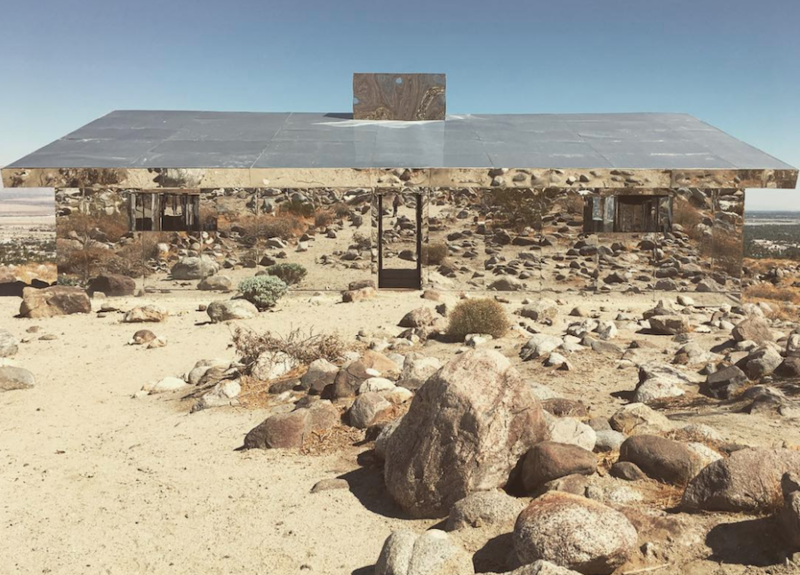 Geoff Manaugh, author of BLGBLOG, visited the extremely Instagrammable Mirage by Douglas Aitken in the California Desert which is clad with mirrors both inside and out. The DesignPhiladelphia conference shared their city’s redeveloped Navy Yards, landscaped by James Corner Field Operations. This last one is short and sweet, and we tell you this only because of the crushing guilt that would consume us otherwise. Winka Dubbeldam ate a grasshopper. That’s it for today, hashtag archilovers and quote-on-quote gallerinas. See you next week for more drama.